There is nothing like the touch and scent of fine leather! High quality leather seats offer comfort, style and when cared for properly, unbelievable durability. Luckily, the leather used for cars and airplanes seats are usually manufactured and treated in such a way as to make them easier to clean and care for. First, clean the seats regularly. Sounds simple enough? It is! Nevertheless, it is critical. Even more so if it's a light color leather. Dirt and body grease can make their way through any protective layers and permanently stain. Clean leather, vinyl or material car seats and upholstery with AQUILA gentle leather cleaner every month or more often if needed. It will prevent greasy dirt build-up, most noticeably on headrests and arm rests. In time, these build up lessen the leather's breathability and dry up leather. AQUILA is specially formulated for this particular usage as it contains no silicone, glycerine or other ingredients that can build up, damage leather, or leaves sticky and greasy residue that attracts dust and dirt. AQUILA is simple to use, just spray and wipe! For delicate or light colors, spray on a soft cloth and wipe. On regular leathers you can normally spray directly on to the leather and wipe. 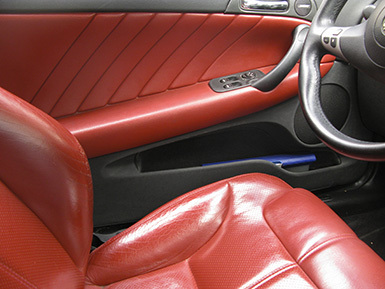 Once or twice a year, use URAD leather cream to moisturize, protect and shine your leather seats. Car seats leather will dry out because of sun exposure and regular wear. Therefore, we recommend this step be done periodically, to prevent cracking, color fading, and to maintain the leather's natural shine! Because every leather is different, always test on a small, less visible area first. Use VERY LITTLE! Don't try to cover up your leather, you only want to moisturize it! A good thumb rule: you should not see the product on your leather, you should only see a nice clean and shiny leather! Also, make sure not to fill stitches. Do not apply while in direct sunlight. To obtain even better results, and to make it much easier to apply, you can mix (about ½-½) TENDERLY and URAD together (See video of how to use Urad & Tenderly together). Adding TENDERLY will make your leather softer to the touch, and it will make a uniform application easier and quicker. To mix them together properly, while the jar is close, shake the jar of URAD until it becomes liquid. Mix together in a separate container approximately the same amount of each product and stir them well. Apply just like you would apply skin cream, spreading it thin and uniformly. Leave to dry. These tips also apply to vinyl seats, dashboard and upholstery. Prevention is key for maintenance of cars and airplanes leather seats. Easy and quick cleaning can save you many problems down the road. Then, applying the above one step moisturizing protecting and softening treatment, in most case just once a year, despite the daily usage they may be exposed to, will go a long way to preserve your leather seats and upholstery value, and keep them feeling and looking like new for many years!